We are a green bean loving family, and this is our new favorite way to make them. 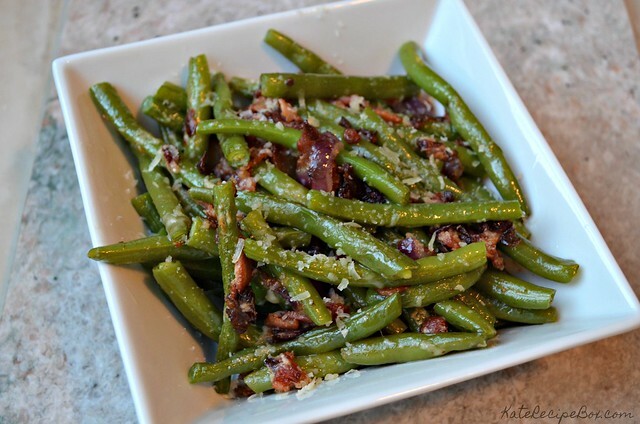 I made these green beans as a possible option for the upcoming holidays, and my family gobbled them up. I can’t remember the last time we didn’t have leftovers of our veggie dish! One of my favorite parts of #Choctoberfest is getting a chance to show how versatile chocolate can be. Everyone always jumps to cakes and brownies, but there’s so much more than that – how about some chocolate for dinner? 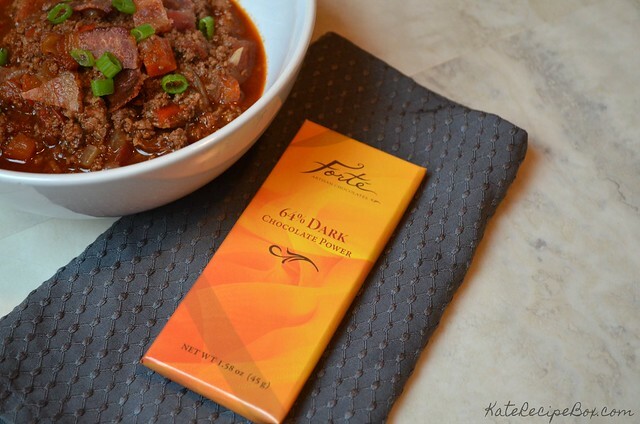 This delicious chili uses a full bar of Forte chocolate but if you’re thinking “chocolate with meat? gross!”, you’ve got it all wrong. 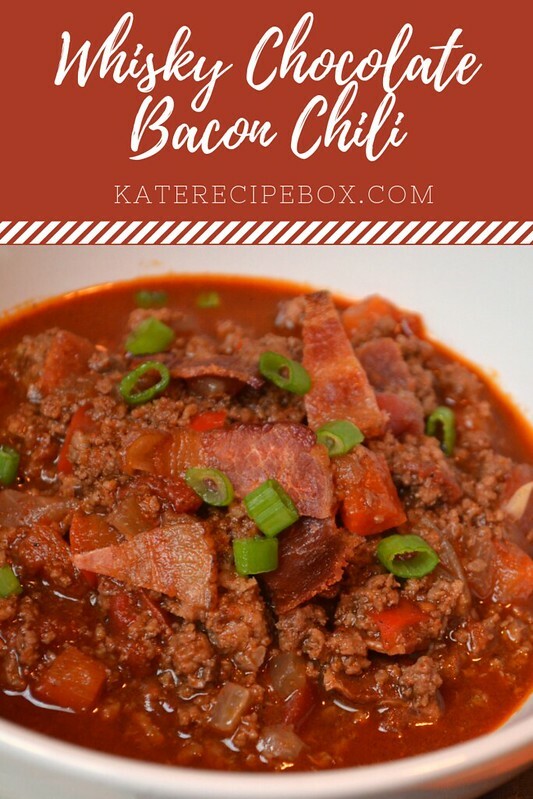 The chocolate isn’t going to be obvious when you dig in, but it add a great depth of flavor and an amazing smoothness to the chili. Forte’s motto is “Celebrate Life through Chocolate”, which I’m totally on board with. 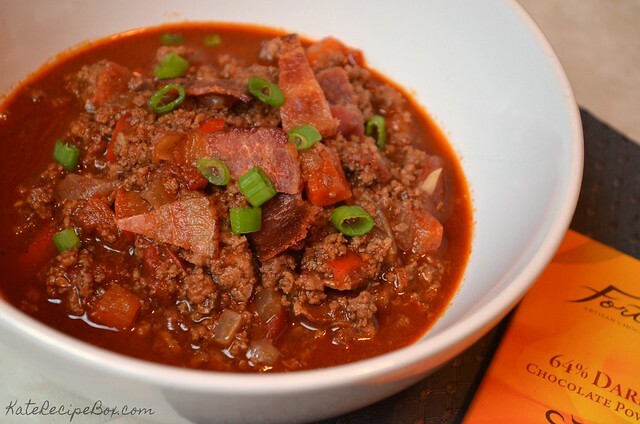 This chili is simple enough that you can celebrate any day. Forte is offering a special deal during Choctoberfest – use code CHOCTOBERFEST2018 for buy 3 get 1 free chocolate bars. In a large pot, crisp the chopped bacon over medium high heat. When cooked, remove the bacon to a bowl with a slotted spoon but leave the drippings. Add the ground beef and brown, breaking up the chunks as you go. When it’s about halfway cooked, add in the onion and peppers. Cook until the meat is no longer pink and the onion is soft. Stir in the tomatoes, garlic, chili powder, cayenne, paprika and cumin. Bring to a boil. Stir in the whisky and half of the bacon. 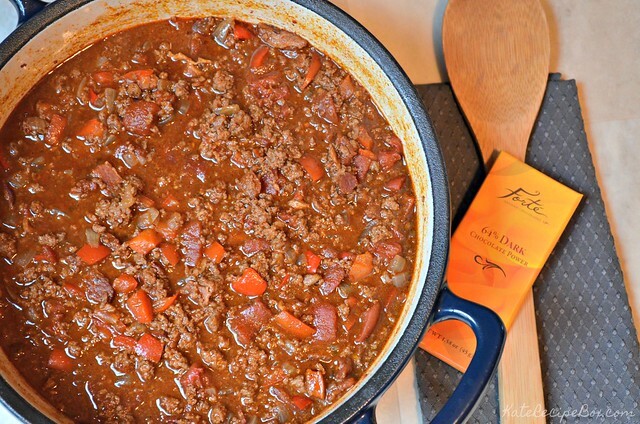 Reduce to low and simmer for an hour. Stir in the dark chocolate until melted and evenly combined. 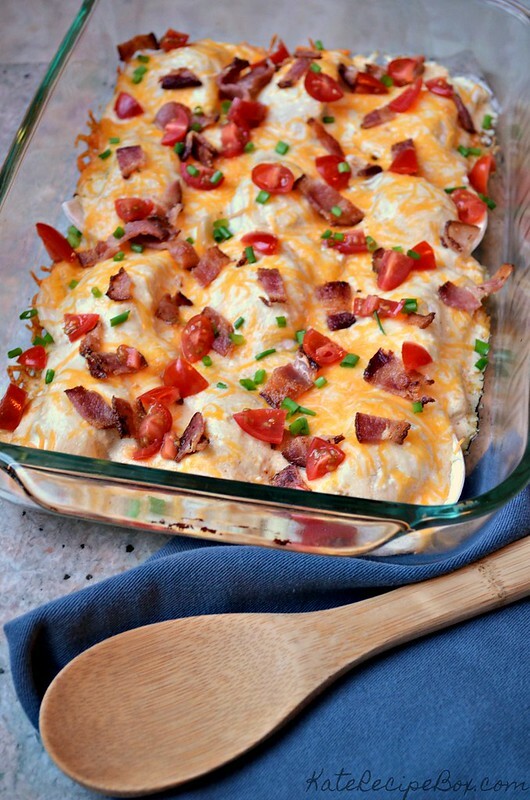 Serve topped with chopped green onions and remaining bacon. 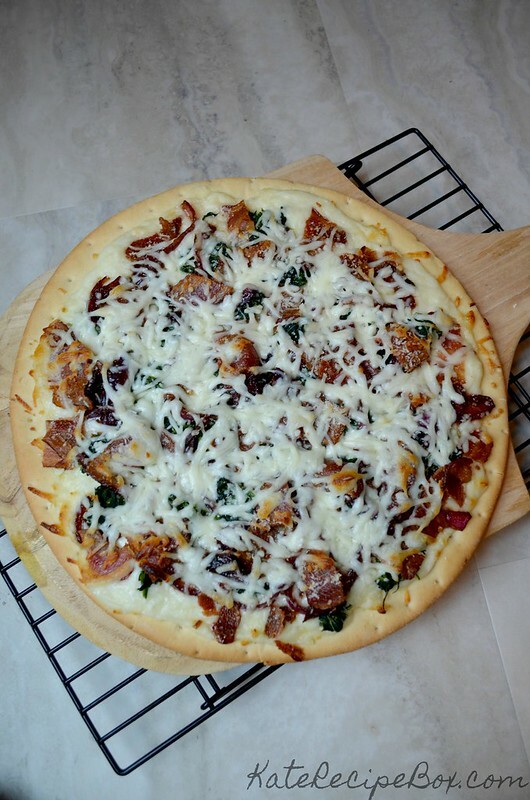 It’s National Pizza Month – a holiday my kids can really get behind. Even as “good eaters”, they’re not immune to the lures of a good pie, and when tasked with picking dinner, they’ll pick pizza 99% of the time. 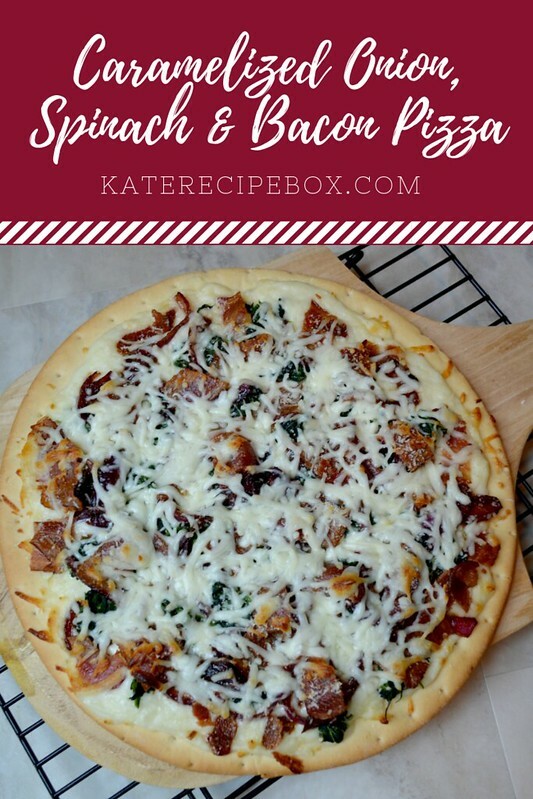 But, they rarely want anything other than cheese pizza, which is why I got excited for this linkup – an excuse to make a blog worthy pizza? Sold. This pie is delicious, but the onions are what really sold me. 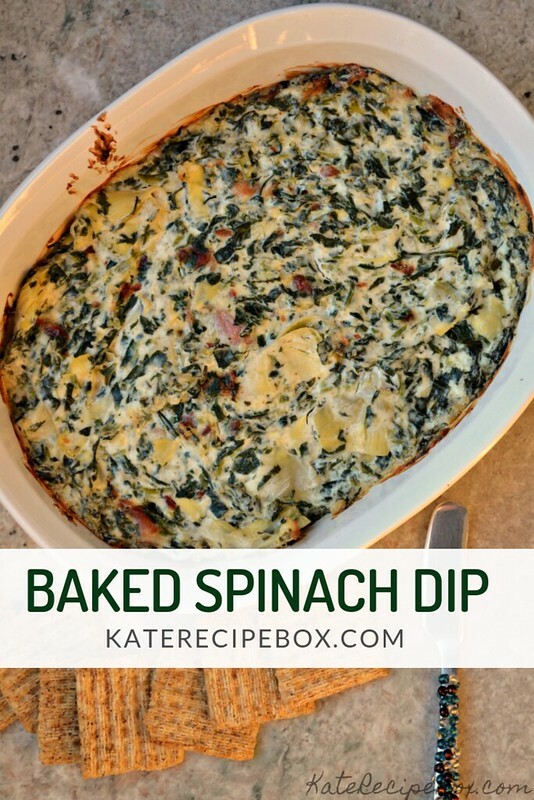 Hitting them with the balsamic vinegar at the end add such a great depth of flavor – and they pair brilliantly with the bacon and spinach. This is easily one of the best pizzas I’ve ever made! Preheat oven to 475 degrees. Put your pizza stone in the oven, if you have one. In a skillet over medium high heat, heat the olive oil. Slice the onion thinly and add to the pan. Season with salt and pepper. Cook until onion is soft then stir in the sugar. Cook for another 5-10 minutes, until caramelized. Stir in the balsamic vinegar and cook another minute. Remove from heat and set aside. Roll out the pizza dough into a 12″ round. In a small saucepan over medium heat, melt the butter. Whisk in garlic and flour and cook for one minute, stirring constantly. Slowly whisk in the milk. Season to taste with salt and pepper. While stirring constantly, bring to a boil. Spread the garlic sauce over the prepared dough. Top with half the mozzarella and half the Parmesan. 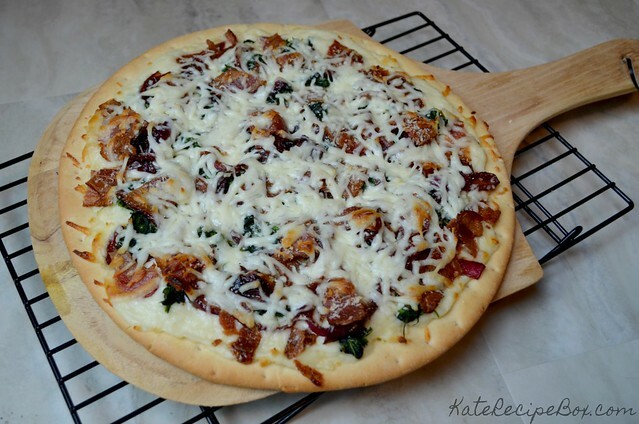 Sprinkle bacon, onions, and spinach evenly over the pizza. Top with remaining cheese. Bake for 8-12 minutes, until the crust is golden and the cheese is melted. I have been on a total de-cluttering binge lately. Cook all the things forgotten in the freezer! Clean out the cedar closet! Get rid of all the sippy cups that don’t get used! Purge old purses! The other night I was watching TV and playing on the laptop and decided to start deleting old, unneeded blog photos from the computer. Buried in the blog folder where the shots of this casserole – and I realized I never actually blogged it! I’m sorry. I was holding out on you guys. 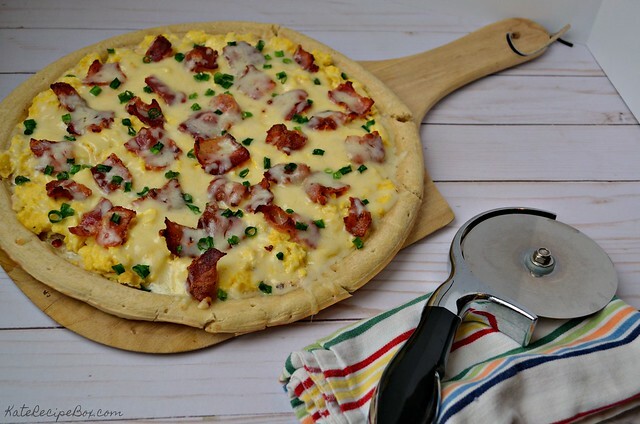 This is amazing – hands down my favorite breakfast casserole. I made this for a Mother’s Day brunch and it was so amazingly well received. It’s easy to see why, though – everything bagels, bacon, melty cream cheese – what’s not to love? And the fact that you can prep it ahead is an added bonus. If you’re looking for a great, filling brunch dish, this is it. I promise you won’t be disappointed! Spray a 9×11″ casserole dish with non-stick spray. Spread the bagel pieces evenly in the bottom of the dish and top evenly with bacon crumbles, 1/4 cup cheddar cheese, and Monterey Jack cheese. In a large bowl, whisk together the eggs, milk, mustard, salt, and pepper until well combined and pour over the bagel pieces. Press down lightly on the bagel pieces to make sure they all absorb some of the liquid. Cut the cream cheese into small chunks and sprinkle over the bagels. Top evenly with half of the fresh chives and the remaining cheddar. Cover tightly and refrigerate for at least two hours – overnight is perfect! 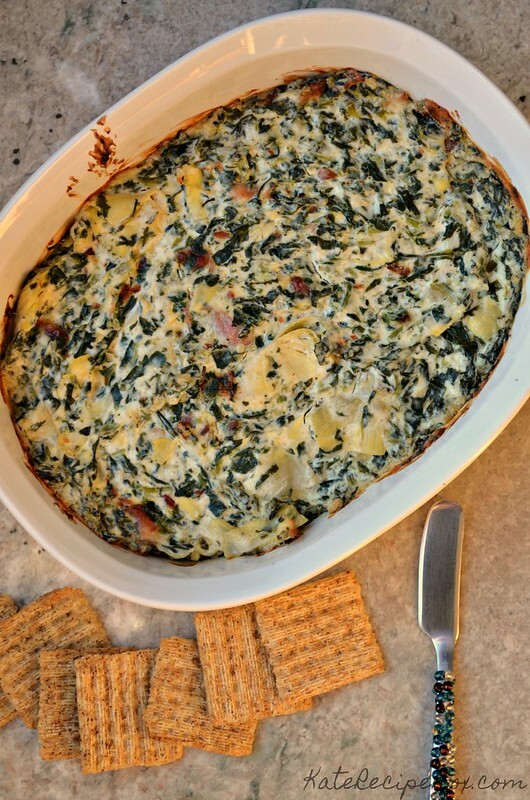 Preheat the oven to 350 when ready to bake – let the casserole stand at room temperature during preheating. Cover lightly with foil sprayed with non-stick spray and bake for 40 minutes. Uncover and bake an additional 15-20 minutes, until the center is set. Let stand for 10 minutes before serving. So far, Jake is not a picky eater. I know we’re just getting into toddler-battle territory so it may change but for now we’re still happily surprised every time he tries and loves a new food. One of our recent finds is pomegranate. I bought one to make this salad and tossed him a few arils while I was prepping things. He devoured them and screamed for me. At this point, the kid would probably eat his weight in pomegranates if we let him. I’ve bought more pomegranates in the last few weeks than I have in all my previous years of grocery shopping combined. 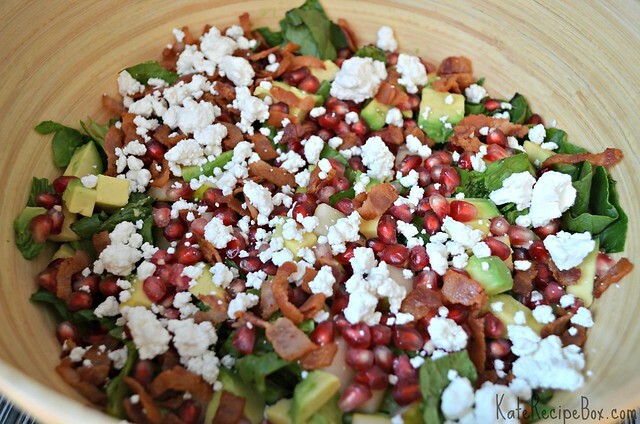 While the pomegranate was the standout for Jacob, he did eat some of the bacon, goat cheese and avocado too. The adults happily ate everything, of course! 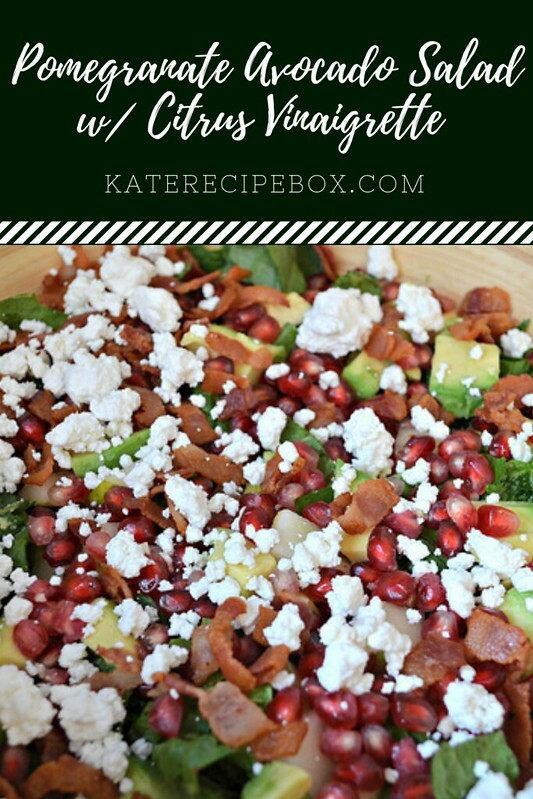 This salad is going to make a repeat appearance at our Thanksgiving table this year. Toss together in a large bowl and serve with citrus vinaigrette. I’ve found that when life gets busy, I always return to what I know works. Go-to outfits, go-to routines, and of course – go to meals. 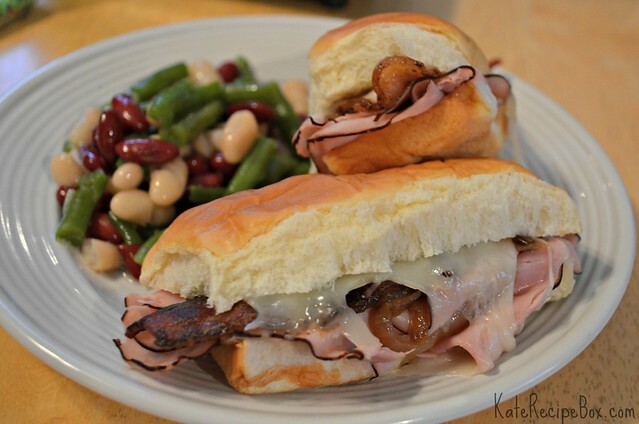 This is one of our go-to meals – and has been since I first posted it in 2011.